Comments: In 1889 there were several celebrations for the centennial of Washington's inauguration as the first president of the United States, which took place in New York City on April 30, 1789. 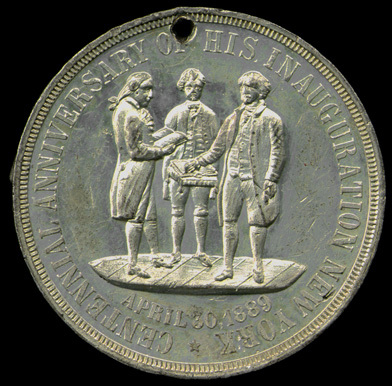 The obverse of this medal shows an undraped bust right portrait while on the reverse is a scene of washington taking the oath of office. 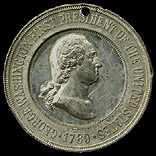 This medal was issued in Bronze and white metal with a hole at the top to allow for suspension from a string or ribbon. The reverse design was also used on two other contemporary medals, Douglas 48 and 50. 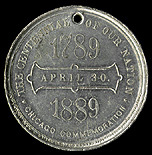 Comments: This medal was struck by Childs and Company Medalists of Chicago, Illinois for the Chicago Centennial Celebration Committee. All examples are holed and were issued with a red, white a blue suspension ribbon that was 4mm wide and five inches long. The obverse shows an undraped bust left portrait of Washington with the dates on the reverse. 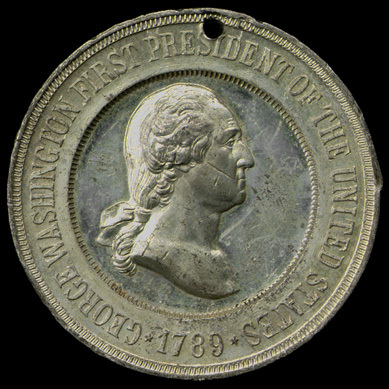 This medal was issued in several rare varieties that differ in the reverse legends. Five examples have E PLURIBUS UNUM in place of CHICAGO COMMEMORATION (Douglas 51B); others have that area replaced with PERU ILL COMMEMORATION (Douglas 51E, two known) or COMMEMORATION/ SPRINGFIELD, ILLINOIS (Douglas 51G, six known) anther variety, only discovered in 1983, has a reverse stating: WASHINGTON CENTENNIAL SOUVENIR above and then below PUBLIC SCHOOL OLNEY, ILL. (Douglas 51D, one known). 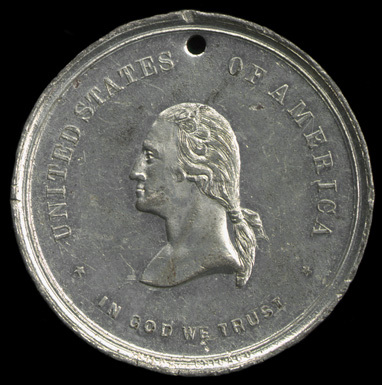 All these varieties were struck by Childs and only survive in white metal. Apparently several varieties were also issued in a very soft pot metal that could be easily bent and thus do not survive. 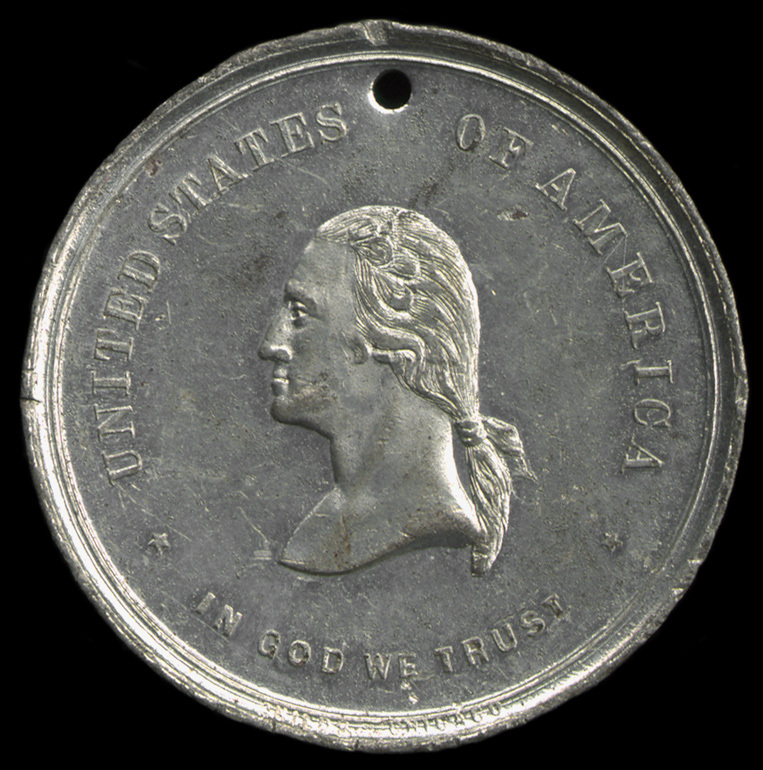 Rulau and Fuld suspect other varieties may have been struck in this soft metal and no longer exist. References: Rulau and Fuld, p. 212.